I find inspiration in daily readings! Congratulations to you and Jeanette! I'll have to get this book for sure. Hi Susan .. that's great news that you're included in "Love is a Verb" - together with your friend both offering devotional readings. I don't 'do' daily readings but my life may change as time goes on - I enjoy reading snippets like these. It is always fun to be "in" a book with a friend. Whent hat happens here, we get together and do a book signing. Congratulations! Hi Hilary - Jen and I were delighted when both of our devotionals were accepted. Hi Linda - I'd love to do a book signing with Jen, but distance makes that impossible. I don't read devotionals as often as I should. I have a few books at my bedside and try to read some at nigh. I do like daily readings. If I buy this book, will you autograph it for me? :) Congrats to you and Jen! Congratulations to two of my friends! What a wonderful coincidence. I do like a daily reading. I love to use "God Calling" after my Bible reading. Congrats, Susan! How fun that you and Jeanette are both featured in the same book. I love devotional readings. I'll have to check this book out and look for your piece. Hi Terri - I don't read them every day. My Bible takes precedence over other material. I do have one devotional I receive from a ministry every month. I try to get to that one at least a few times each week. Hi Karen - LOL! If you pay the postage, I'll sign it. Hi Marja - I know you could write devotionals. The secret is getting your point across in a few words and making sure there's a take-away for the reader. Hi Rhonda - Thanks! Why don't you try writing a devotional? Wouldn't it be cool if 4 or 5 of us got into the same book? Hi Sarah - Jeanette Littleton was the editor for this book. She did a great job. Hi Sandie - Thanks for the congrats. Congratulations to you and Jeanette. I try to choose a devotional book to use for a year. Oswald Chambers, Spurgeon, Michael Benson's book, the Women's Devotional Bible-second volume. In the past I have submitted to a few but wasn't accepted. Congratulations! How exciting for you and Jeanette. Much continued success to you both. Congratulations, Susan (and to you, too Jen!)! What a wonderful accomplishment! Praying the Lord uses both of your devotionals in a powerful way to accomplish His goals. God bless, you! Hi Janette - Thanks! Jen has a book coming out in April 2012. I'm excited for her and can't wait to do an interview. Hi Maria - Since the devotional is a companion piece to Gary Chapman's book, "Love Is A Verb," we're hoping it ministers to a wide audience. Hi Kathi - Thanks! 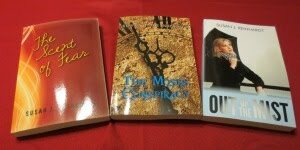 Devotional writing is where I got my start in publishing. Congratulations! Isn't it exciting to get those advance copies in the mail? I've contributed to Barbour's Heavenly Humor series, and I also enjoy daily readings. Sarah Young's "Jesus Calling" is one of my favorites. How wonderful! I've read a number of things by Gary Chapman, so I know your contribution must have been very well written. I'm a daily devotional girl, though often I skip the formal ones in favor of quietly crafting my own from scripture. No matter, the Lord is looking for true hearts that center on spirit & truth. They are inspired by oh-so many things.